After their EP 'Possessed' dating from 2007, dutch ‘heavy thrash metal’ band Tribal Spirits releases their first full-length album 'Overthrown Reality' this year. Although still unsigned and having had some line up changes, the band’s popularity in Holland is growing steadily as they have given a lot of gigs since 2004 and even have their own merchandise. Let’s check out this new album. Overall, the album rocks very hard! The sound causes a lot of adrenaline rushes, and that’s generally what you like being a metalfan. Heavy and catchy parts are altenated by melodic riffs and sometimes a slower acoustic part or guitar solo, which makes the songs very variable. Add to this a low heavy grunt and excellent drumming and you have a fine heavy thrash metal album. Especially the song 'Lost in Grudges' stands out for me, it’s the perfect mix of melody and power and very catchy. 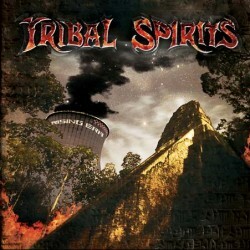 As for me, Tribal Spirits definitely has potential to become one of the greater thrash bands in The Netherlands. The only problem is that there are a lot of bands with this sound formula these days and they really need to stand out to be noticed; that’s maybe the one thing Tribal Spirits still lacks. It’s not that the band is adding something special to the formula, although they worked it out very well. Maybe that’s one thing they can work on at for their future album. Apart from that, I think this album can be recommended to anyone who likes melodic and heavy thrash metal, or just likes to go out of his mind.